BL*. . Wallpaper and background images in the Brucas club tagged: brucas love. 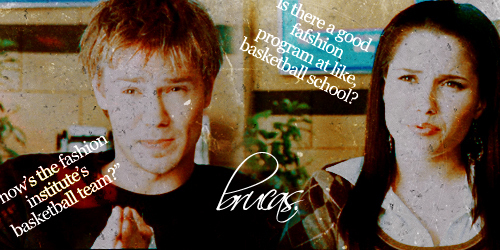 This Brucas fan art might contain zeichen, plakat, text, tafel, schilder, and poster. awww, love those scenes. :P goes to show how brucas wanted to be together when they were together that they were willing to give up their dreams school so they could be together, hmmmm didnt go that way with leyton though, its like they couldnt wait to be away from ecah other. sorry bad leyton hating me speaking here, im in some serious need of brucas because im getting meaner. love the pic.